Did you know you can get straight teeth without brackets and wires? You can enjoy an FDA-approved treatment that is virtually invisible. 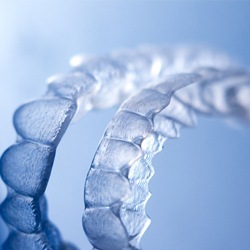 Invisalign in Viera is the preferred orthodontic choice among teens and adults who want to correct their bite and alignment concerns. 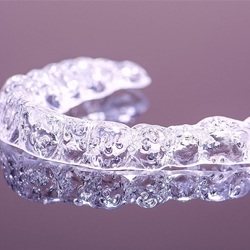 A series of clear plastic aligners discreetly move your teeth to give you the confidence you need to smile brightly throughout your treatment. Dr. Cedric C. Chenet will give you the smile of your dreams without metal braces. 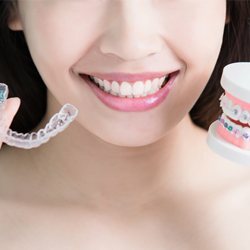 Now, Invisalign can correct a variety of bite and alignment cases. It is effective for treating gapped, overcrowded, rotated, or tilted teeth without brackets and wires. If any of these issues sound familiar, you may be a candidate for the clear aligners. Your dentist in Viera, Dr. Chenet performs the comprehensive consultation you need to ensure Invisalign is right for you. To start your journey to a straight smile, Dr. Chenet takes a digital impression of your mouth to create a 3D model. This is used to map the movement of your teeth through custom-fabricated clear aligners. Your series of aligners gradually move your teeth into position. On average, it takes about 12 months to finish your series. At the end of your treatment, you will briefly require a retainer. During your treatment, you must be committed to wearing the aligners for at least 22 hours per day, only taking them out when eating, drinking, or caring for your teeth. You can expect to wear each one in the series for about 1 week before switching to the next. Since no wires are used to move your teeth, you do not need appointments for adjustments, so you will spend less time in the dental office. You will still need to come in every few weeks to allow Dr. Chenet to monitor the movement of your teeth. Nearly invisible for a discreet treatment. Custom-fit to eliminate slipping when speaking and smiling. Smooth aligners prevent irritation to the lips and cheeks. Easy oral hygiene and aligner care. Less time in the dental office for a convenient treatment. There is no set price for Invisalign because the amount is based on your individual treatment plan, such as how many aligners are needed. Now, many dental insurances cover a position of the cost to reduce the amount you need to pay out-of-pocket. We accept a variety of payment options to keep your new smile affordable. If you are ready to get the straight smile you have always wanted, do not wait. Get started today by scheduling your consultation for Invisalign.